Hundreds of auto museums across the country feature antique, classic and unique vehicles. Coast-to-coast, they run the gamut, from historical to current, practical to novelty, most popular to one-of-a-kind. 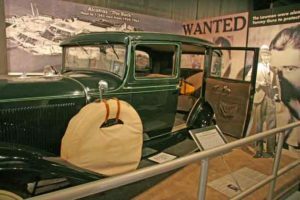 Some focus on makes, like the National Packard Museum in Warren, Ohio, and the Hostetler’s Hudson Auto Museum in Shipshewana, Ind. Others highlight types, such as the Penske Racing Museum in Phoenix, the National Rod & Custom Car Hall of Fame Museum in Afton, Okla., and Rusty’s TV & Movie Car Museum in Jackson, Tenn. But people in the Rockford area don’t need to map out a cross-country trip to see cars like these. They just need to head to Historic Auto Attractions, right off Rockton Road in Roscoe, Ill. Here, in a 36,000-square-foot custom building, is one of the most eclectic and impressive collections around. There’s the 1956 Cadillac Secret Service car that was directly behind John F. Kennedy in Dallas on Nov. 22, 1963. Emperor Hirohito’s 1935 Packard limo. Adolph Hitler’s six-wheeled, 1939 Mercedes staff car. Evita Peron’s 1950 Rolls Royce. A 1929 Chandler two-seater Indy race car. Tom Sneva’s 1977 Indy car, the first to break the 200 mph barrier at Indianapolis Speedway. The 1964 Ford Galaxy police cruiser from “The Andy Griffith Show,” signed by cast members. A DeLorean from the 1985 film “Back to the Future.” And that’s just a quick sampling. It’s the brainchild of local entrepreneur Wayne Lensing, who owns and operates Lefthander Chassis in Roscoe, which builds and manufactures chassis for short-track racing. The company also distributes parts for all types of race cars, supported by a network of dealers across the United States. Lensing, also a licensed pilot, has raced professionally; in 2007, his son, Dan, who now races the Lefthander house car, finished third in the National Short Track Championships at Rockford Speedway. In 1990, Lensing visited the famed Auto Collection, housed in the fifth floor parking garage of the Imperial Palace Hotel in Las Vegas. Among this amazing assemblage of cars were many that had been owned by world leaders and businesspeople; the hotel’s owner, Ralph Englestead, had sent people all over the world to search for them. 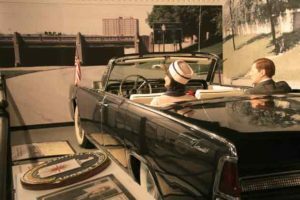 Among thousands of items in Lensing’s JFK collection is a replica of the Lincoln Continental in which Kennedy was riding when shot (above); the actual 1956 Cadillac Secret Service car directly behind Kennedy in the motorcade. So Lensing continued to build his racing business, all the while visiting car museums, taking notes and dreaming of the galleries he would create if he ever got the chance. That chance came in 1999, when he learned that Englestead was terminally ill and making arrangements to sell his collection. Lensing’s Historic Auto Attractions opened on Memorial Day 2001, with an impressive turnout of visitors drawn in by local media coverage. It will celebrate its 10th anniversary on Memorial Day 2011, and the exhibits, collections and visitors continue to grow. Lensing joined the American Association of Museums, which led to him receiving listings from such prestigious auction houses as Sothebys, Christie’s, Guernsey’s and Heritage. This helped Lensing to grow his collection, and as he did, his reputation spread, allowing him to obtain some amazing artifacts. This is one way that Lensing has set himself apart from other auto attractions. It’s not just cars and car memorabilia. Lensing wanted his museum to create a more meaningful experience for visitors. So, even with the amount of energy he puts into tracking down the autos, he puts as much – or even more – into gathering ancillaries that complement them. “The JFK collection we have is the largest in the world,” Lensing says. 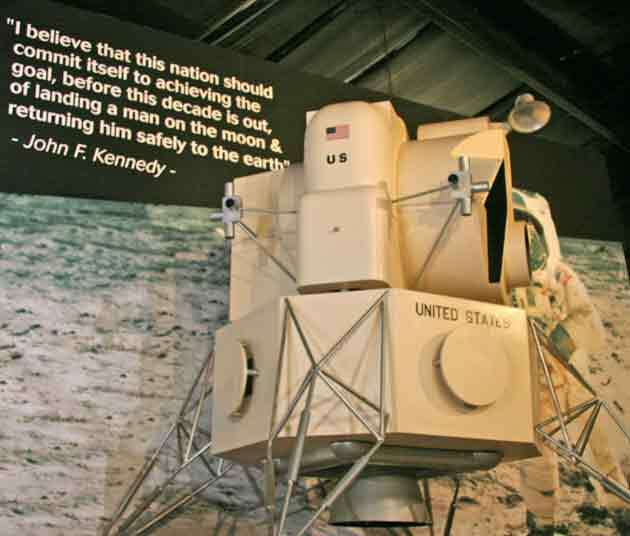 “Robert White was fascinated by President Kennedy, and at one time, his was the largest museum on Kennedy, in Tampa, Fla. 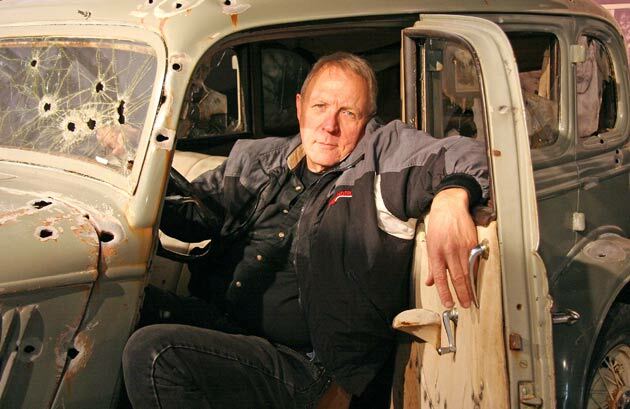 When he passed away, his collection went up for auction, and we purchased a good share of it.” Along with the Secret Service car, Lensing also has the ambulance that transported Lee Harvey Oswald to the hospital after he was shot by Jack Ruby. While the actual Lincoln Continental in which Kennedy rode is on display at the Henry Ford Museum in Dearborn, Mich., Lensing has the same model, in the same color, in position ahead of the Secret Service car, complete with wax figures of passengers Jack and Jackie. The wallpaper display of Dealey Plaza surrounding the two vehicles came not just from history books, but from Lensing’s own camera. He also obtained numerous personal effects and artifacts: all of the items from JFK’s desk in the Oval Office at the time of his assassination; the flag draped over JFK’s casket when he lay in state in the East Room; clothing belonging to both Kennedy and wife Jackie, including more than 20 outfits and gowns out of the 300 designed for the First Lady by Oleg Cassini. Many of the items are compelling, especially to those who remember where they were when they heard the news; who watched in horror as Oswald was gunned down on live television; who cried over the televised images of Jackie, Caroline and John-John, standing on the steps of the Capitol Building as the solemn funeral procession passed by. On display at Historic Auto Attractions is an artifact from that iconic tableau: the hat and veil worn by Jackie. Several of these personal items came directly from Evelyn Lincoln, Kennedy’s personal secretary. She came into possession of them when, just hours after Lyndon Johnson was sworn in as president, she received orders to clear the Oval Office immediately of anything that belonged to Kennedy. She held onto them for several decades, before Robert White acquired them from her. This 1932 Studebaker was John Dillinger’s getaway car in a bank robbery in Indiana, the largest of its day. Lincoln was in the Dallas motorcade that day, two cars behind the President, and followed Kennedy’s parade car to the hospital. There, Jackie handed her bloody gloves to Lincoln, who stuffed them into her purse, causing blood to transfer to other items. Also on display in Roscoe is that purse; an envelope, addressed to Press Secretary Pierre Salinger, stained with JFK’s blood; and the eyeglasses Lincoln was wearing that day. There’s more. Lensing has the window that was next to the one Oswald shot from in the Texas School Book Depository, a section of the fence from the grassy knoll, and the jacket and shoes worn by Ruby when he shot Oswald. He even has the mail-order catalog Oswald used to buy the assassination gun, from Klein’s Sporting Goods in Chicago, addressed to Oswald under a known alias. Other exhibits and their connected items illustrate Lensing’s determination to convey an experience through his cars. In “Gangsterland” is a 1932 Studebaker, used as a getaway car by John Dillinger during a bank robbery in Indiana. Memorabilia and his “Wanted” posters adorn the walls. Also on display are several of Dillinger’s guns, from when he was a young boy up to his death; the police pistol that fired the fatal shot; Dillinger’s death mask – typical gangster stuff. But there’s also a vintage movie poster for the 1934 film “Manhattan Melodrama,” starring William Powell, Clark Gable and Myrna Loy, and the actual suit worn by Gable in the film. It is these kinds of connections that make this more than a car museum. In the Lincoln Room, a wax figure of Abraham Lincoln sits pensively in the center, surrounded by items that reflect his life and death. There’s a brick from the Lincoln-Herndon Law Office in Springfield, Ill., along with several legal documents signed by Lincoln, Esq., and his chair from the railcar he rode in as President. There are six handles from Lincoln’s casket; Mary Todd Lincoln’s mourning skirt; one of the coins placed on Lincoln’s eyes after his death; the leather flag carrier and the flag used by Smith Stemmel, Lincoln’s personal bodyguard and standard bearer. Wherever the President went, the standard bearer bore the flag. The story is taken further, to the execution of the conspirators: There are the manacles used on Lewis Powell, and a bloodied bandage taken from Mary Surratt’s hand after she was hanged. Over the years, Lensing purchased wax figures from attractions that closed, and custom-ordered others from an artisan in Los Angeles. It was that artist who called Lensing’s attention to more than 300 figures up for sale in Norfolk, Va., from the estate of a man who had run several wax museums in places like Las Vegas and Branson, Mo. On display in “Wild West Americana” are figures of John Wayne, Clint Eastwood, the cast of the television show “Bonanza” and James Arness, aka Matt Dillon from “Gunsmoke.” Lensing also has the complete costume Arness wore in that role; a cowboy hat owned by Wayne and one owned by Tom Mix; and Buffalo Bill Cody’s beaded deerskin jacket. Historical artifacts include a Winchester rifle used by Chief Spotted Elk at the Battle of Little Big Horn and other antique guns; an 1860 horse-drawn hearse and a motorized 1906 Oriental Buckboard. 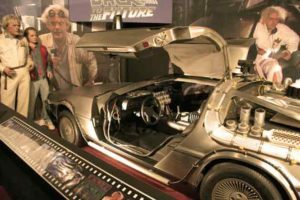 There are hundreds of pieces of furniture, lamps and clocks from the White House; the entire living room set from the TV series “Sanford & Son,” along with a 1950 Mercury pickup from the show; the “National Lampoon’s Vacation” station wagon; the “Ghostbusters” ambulance; two Earnhardt driving suits; a car and driving suit on loan from local racer Danica Patrick; a Mercury space capsule training module and an Apollo capsule training module on loan from NASA. And the collection continues to grow. Back at the front of the museum, Lensing can’t resist opening some packages that have arrived. One contains the dress worn by James Garfield’s widow at his funeral. “I’d really like to get more period dresses and do some kind of exhibit around the First Ladies,” he says. The other cartons contain additions for his Wild West exhibit: two hubs from a wagon that belonged to a member of the Donner Party, an ill-fated group of pioneers who headed west from Springfield, Ill., in 1846. They were stranded for four months in the Sierra Nevada Mountains by a winter storm, and the survivors eventually resorted to cannibalism to stay alive. Lensing examines the letters of authenticity before packing everything back up. Lensing has become so well-known that NASA contacted him, to ask if he had room to take a lunar training module, Mercury and Apollo training capsules and other items. All are on indefinite loan. Lensing seems an unlikely museum curator. He admits he wasn’t much of a history buff before starting Historic Auto Attractions. Graduating from high school in Iowa in 1966, he was what we nowadays call a gearhead. In 1968, Lensing went to work at the Chrysler plant in Belvidere and attended his first race at Rockford Speedway the following summer. The car-loving speed junkie was hooked. During this time, other racers began asking Lensing to work on their cars and make them faster. Shortly, he was building entire cars for other drivers, working at Chrysler from 6 a.m. to 3 p.m., and then toiling in his garage until 2 a.m., grabbing a couple hours of sleep and heading to his shift at the plant. Finally, in 1984, after 16 years, Lensing quit Chrysler to devote himself full-time to his own business. Always a perfectionist, Lensing says he mingles anonymously with the museum’s visitors and listens to their comments, to see what works and what needs improvement. Most of what he hears is positive. This entry was posted on Friday, May 20th, 2011 at 11:58 am	and is filed under Features, Top Posts. You can follow any responses to this entry through the RSS 2.0 feed. Both comments and pings are currently closed.